Not to be confused with the Rumiko Takahashi fantasy romance series Inuyasha. Inuyashiki (いぬやしき) is a Japanese science fiction manga series written and illustrated by Hiroya Oku. Inuyashiki debuted in the January 2014 issue of Kodansha's seinen manga magazine, Evening and ended in July 2017. Ten compilation volumes have been published. Inuyashiki Ichiro is a middle-aged, friendless man with an uncaring family. One fateful evening in a nearly empty public park, he is struck by an explosion of extraterrestrial origin, and his body is replaced by an incredibly powerful, but still outwardly human, mechanical body. He quickly realizes the extent of his body's powers, and after saving a homeless man being beaten by a pack of teenagers, he decides to dedicate himself to doing good, using his powers to heal those with incurable diseases and fight crime. 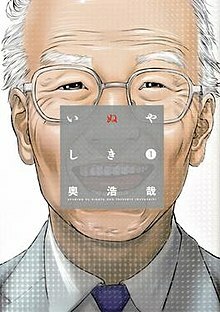 However, a teenager who was with him at the time of the explosion, Shishigami Hiro, had the same fate as Ichiro, but unlike Inuyashiki, Shishigami becomes a psychopath who goes about using his new found abilities to murder people, from classmates that annoy him to innocent families, including young children and infants, just for amusement. His acts of merciless cruelty brings him the attention of the police, who can do nothing to stop him. Hiro becomes the most wanted criminal in the country. The series follows these two different individuals who once shared the same bizarre experience, as their paths are destined to clash. The head of Inuyashiki family who looks older than his age, being 58 years old. He has no friends and is disrespected by his family with the only thing he trusts being his dog Hanako. He was on the verge of death, but after being struck by extraterrestrial beings he was transformed into a cyborg. Not wanting to lose his humanity, he fights to save those in trouble. A teenager who was with Inuyashiki when the extraterrestrial beings struck them to death. He also became a cyborg, but instead he takes pleasure in killing people which, according to him, keeps him human. The only people he cares about are his mother, Andō, and later Shion and her grandmother. Hiro's childhood friend who initially shut himself in at home after being bullied at school. He is the first person to know about Inuyashiki and Hiro's cyborg bodies. Wanting to stop his friend from killing, he teamed up with Inuyashiki. He is a fan of Gantz, another manga of Hiroya Oku. Inuyashiki's teenage daughter and a classmate of both Hiro and Andō. She secretly wants to become a manga artist. A classmate of Hiro who has a crush on him. She sheltered Hiro at her home after he first escaped from the police, and become another woman that Hiro loved. Kodansha's American subsidiary, Kodansha Comics, are publishing the manga in English. Crunchyroll published the manga in a digital format. The manga ended in its 10th volume. An anime television series adaptation by MAPPA began airing on October 12, 2017 and a live-action film adaptation has been announced for 2018. The anime series' opening theme is "My Hero", performed by Japanese rock band Man with a Mission. The ending theme "Ai o Oshietekureta Kimi e" (愛を教えてくれた君へ, lit. "To You Who Taught Me Love") is performed by the band Qaijff. Amazon has licensed the series and is streaming it online on Amazon Prime Video in Japan and overseas. It was also streaming on Anime Strike in the United States. Amazon discontinued Anime Strike on January 5, 2018 which in turn offered Anime Strike titles, including Inuyashiki, free to stream for Prime members. Salaryman Inuyashiki Ichirou feels trapped within his humdrum life and ageing body, automatically going through his workday routines. When he takes his wife and children to their new modest home, the children are unimpressed. After a visit to the doctor where he is diagnosed with stomach cancer and given 3 months to live, he is unable to tell his self-absorbed family. One evening, while walking his dog in a park on a hill, he breaks down and cries. Suddenly he and a youth standing nearby are struck by a mysterious explosion apparently of extraterrestrial origin. His body is replaced by an incredibly powerful, but still outwardly human, mechanical body. He realizes some of his body's powers after saving a homeless man being beaten by a pack of teenagers. The electronics within his body also manages to identify and expose the teenagers. He then realizes that even though his body is now an electromechanical cyborg, he still thinks and feels like a human. Student Hiro Shishigami remarks that one of his friends, Naoyuki Andou, has been absent from school and goes to visit him. Hiro talks about the spate of recent slashing murders, jokingly accusing Naoyuki. He then reveals that he is no longer human and demonstrates some of his powers. Naoyuki is impressed until Hiro causes cars to start crashing in the street and realizes they are not just tricks. Hiro reveals his cyborg body and convinces Naoyuki to return to school, calmly offering to kill the student who beat him up. Naoyuki however is fearful about Hiro's mental state and powers of his old school friend. After leaving, Hiro picks a house at random and casually kills the occupants by shooting an invisible beam. His remarks that he feels 'alive'. When the daughter comes home, he threatens to kill her, and Inuyashiki hears her screams of fear. He drives, following the voice he hears in his head, until, while stopped in traffic, hears her die. He finally arrives at the house, finding the bodies, but is confronted by Hiro who shoots him. As Hiro leaves however, Inuyashiki has already recovered and stands at the doorway, much to Hiro's amazement. Surprised at Inuyashiki's recovery, Hiro uses the jets in his back to fly off. Inuyashiki realizes that Hiro has undergone the same transformation as him but cannot understand his motivation. Hiro again visits Naoyuki who still refuses to return to school. Meanwhile, Inuyashiki sees some thugs take a young man into an alley. He follows them and beats them up using only his physical strength. He then hears the voices of people trapped in a building on fire, and tries to invoke the flying mechanism he saw Hiro use. Desperately trying he sings the Astro Boy theme song and takes off but has difficulty controlling the jets. He eventually reaches the scene, rescuing those trapped inside. His remarks that he feels 'so happy'. Hiro finally convinces Naoyuki to return to school, but when the bullies threaten him, Hiro intervenes and forces them to back off. Later that afternoon he kills four of the boys at a distance as Naoyuki watches. Hiro describes his many powers, including control over electronic devices, including milking an ATM. Naoyuki then says he can no longer be friends with someone who kills and steals, and Hiro walks off. That evening Inuyashiki discovers his healing power when he revives a cat that had been run over and thanks God. Meanwhile Hiro again enters a house at random and kills all the occupants. A Yakuza is humiliated by his boss Samejima for death of a woman from a drug overdose. Elsewhere, Fumino Inoue, a young woman working in a café becomes engaged to her boyfriend Satoru, but she is abducted on the way home by Samejima's men. She is injected with drugs but wounds Samejima and manages to escape and return home to Satoru. Before they can act, Samejima and his men burst into their apartment to take Fumino. Samejima begins to choke Satoru, but suddenly Inuyashiki arrives at the apartment, disables the men. Inuyashiki begins to crush Samejima who pulls a gun and shoots Inuyashiki in the head and he collapses. When Inuyashiki wakes up, he is alone in the apartment with the dead Satoru. He desperately tries to revive him and Satoru finally recovers. Meanwhile he traces Samejima and flies to find him at a Yakuza meeting. He calls out Samejima and beats him up. When the rest of the Yakuza fire volleys of bullets into Inuyashiki, his cyborg body's self-defense mechanism activates and rockets from his power pack blinds and maims the men, leaving them all crippled for life. He then tracks down Fumino and rescues her, telling her he is no-one special and reunites her with Satoru. There are media reports of the attack on the Koudankai crime syndicate and that another home in the Suganami ward was attacked by a type of firearm but there was no sign of bullets. At school, Shishigami and Andou are suspected by the other students to be responsible for the deaths of Tetchan and the others. Andou tries to report Shishigami but cannot proceed. After reading about miraculous cures, Andou suspects Shishigami, but dismisses it, thinking there may be other like him with similar powers. In desperation he screams out that he is going to be killed, and Inuyashiki arrives at his door. When Inuyashiki admits who he is, Andou vows to help him stop Shishigami even if it means killing him. Fellow classmate, Shion Watanabe introduces herself to Shishigami but is too embarrassed to continue. That night Andou gets Inuyashiki to test his powers, but he has trouble controlling them. Meanwhile Shishigami's mother tells him she has cancer and only months to live. The next morning she finds that she has been miraculously cured, and Shishigami suggests they move to a better apartment with money he fortuitously obtained. Shishigami vows to stop killing for his mother's sake. However, after the media report a breakthrough in the household murder cases, police surround Shishigami's home and attempt to take him into custody. Shishigami escapes the grasp of the police and flees, taking refuge at Shion's house. Meanwhile, Andou tells Inuyashiki that Shishigami has integrated his mobile phone into his electronics system and gets Inuyashiki to do the same. In testing the communication distance, Inuyashiki flies as high as an orbiting satellite. While laying low over the next few days, Shishigami finds out that people are insulting his mother on 2chan. Ashamed at Shishigami's actions and hounded by the media, his mother commits suicide. Distraught at his mother's death, Shishigami goes to his father's house. Finding the media talking to his father outside the house, he kills them in front of his father and then seeks revenge against everybody on 2channel who posted the insults. He starts by seeking the person responsible for starting the topic. Shishigami kills him by hacking his computer and shooting him though his computer screen. He then traces all of the others who posted and kills them remotely in a similar way. Shishigami returns to Shion's house, overwhelmed by recent events. In a flashback, Shishigami waits for a train in a crowded underground station and a middle-aged man steps in front of it. Later, Shishigami admits to Shion that he is the killer, but she refuses to believe it. He tells her about the railway incident, and the pleasure he felt when a life was erased, and how alive he now feels at taking other people's lives. She refuses to accept that he is not human until he carries her into the sky. Rather than fear for her life, she pleads with him to stay with her and her grandmother. Affected by her genuine kindness and goodwill, Shishigami promises to save the lives of people who are about to die. A woman dying of cancer receives a message on her phone offering help. Shishigami heals her, and then begins healing people on a daily basis, bringing much joy to Shion. Two months later, he and Shion are leading happy lives. People are also relieved that the murders have stopped, however the police may have tracked him down. A police SAT squad invade Shion's house and commence shooting at Shishigami, also killing Shion and her grandmother who are shot in the attack. Under the intense attack, he grabs the bodies of Shion and her grandmother and flies off, later uses his healing power to restore them to life. There are news reports of an impending meteor impact on Earth, but the immediate crisis seems more important. Meanwhile Mari tells the wealthy student Oda that he's wasting his time trying to become a manga artist, while secretly trying to create manga herself. Inuyashiki tells Andou about his estrangement from Mari and they practice using Inuyashiki's powers. Mari is surprised to see Andou with her father and follows them to a hospital where she discovers that her father is the mysterious miracle healer. That evening Mari tells her parents she wants to write manga rather than go to college and surprisingly Inuyashiki supports her decision. Shion and her grandmother find money appearing in their bank account. Shishigami assaults the Gokokuji Police Station, killing everyone inside but leaving one officer to witness his revenge. As Shishigami leaves he is shot by a sniper and fired on by a police assault team. Unconscious, his self protection mechanism raises him off the ground and fires rockets, wiping out the entire assault team and surrounding police. The Inuyashiki family watch TV news of the attack on Gokokuji Police Station by Hiro Shishigami. Meanwhile, Mari's school friend tells her how Shishigami has developed fans among some young people. Suddenly Shishigami announces on all broadcast television that he is declaring war on the country and vows to kill the entire population of 120 million people. He begins killing people at random in the streets of Shinjuku, creating panic. He then telephones a TV presenter and kills him while he is broadcasting live on air. Andou realizes that Shishigami is using smartphones to kill people and through Inuyashiki issues a public warning. Shishigami realizes that Andou is working against him, and is now his main enemy. Shishigami then begins killing people via TV screens and threatens to kill 1,000 people a day. He offers to take Shion and her grandmother away but she refuses and asks him to stop the killing. The next day, Shishigami crashes an in-flight passenger airplane into the city. Shishigami crashes multiple passenger airplanes into Tokyo city, however Inuyashiki manages to save some airplanes by landing them in the bay. Meanwhile Mari Inuyashiki is trapped in a burning building and telephones her father for help. As her father is about to fly to save her Shishigami finds Inuyashiki. After a brief discussion, they realize that they were both in the park when they were struck by a mysterious explosion which resulted in them becoming the cyborgs that they are now. However, Inuyashiki has become a hero while Shishigami sees himself as the villain. Shishigami attacks Inuyashiki, but they are evenly matched and while Inuyashiki tries to reach his daughter, they battle with all of the comprehensive internal weapon systems available to them. Eventually Inuyashiki manages to damage Shishigami, and they both fall to the ground. Inuyashiki recovers and reaches Mari's lifeless body and desperately tries to save her. He finally manages to resurrect her, then goes to save others killed during Shishigami's attack on the city and their subsequent battle. Inuyashiki comes to believe that his whole life was meant to prepare him for this moment, becoming a machine dedicated to helping people. Meanwhile two young women find the severely damaged body of Shishigami in a laneway. Inuyashiki reveals his transformed body to his family, remarking that he may only be a mechanical copy, although when he recalls events from their honeymoon, they realize that he has all of his memories of the past and accept him as he is. Hiro Shishigami visits his friend Naoyuki Ando, just wanting to hang out like before, but Naoyuki calls Inuyashiki so Shishigami leaves. Although his father is hailed as a hero, Ichirou Inuyashiki's son finds school is still a misery. The family spend some time together, but after news reports of the impending approach of a meteor to Earth, Inuyashiki decides to do what he can to stop it. He flies into space and tries to destroy the meteor, but has little effect, but then Shishigami appears. Shishigami asks Inuyashiki to help him self-detonate to deflect the meteor, saying there are also people on Earth that he wants to save. He explodes, but it is not enough, and after telling Andou that he is returning to Earth, Inuyashiki also self-detonates to complete the task. After the destruction of the meteor, life on Earth returns to a semblance of normality. Following these events, Inuyashiki's son learns to fend himself from bullies and Mari's manga is selected for publication. On December 21, 2017 a teaser trailer and website appeared for a live action adaptation of Inuyashiki. The film, the first in a planned trilogy, was released on April 20, 2018, directed by Shinsuke Sato who had previously directed the live action Gantz and stars Noritake Kinashi as Inuyashiki Ichihiro and Takeru Satoh as Shishigami Hiro. Volume 2 reached the 18th place on the weekly Oricon manga charts and, as of November 2, 2014, has sold 76,886 copies; volume 3 reached the 15th place and, as of March 1, 2015, has sold 74,974 copies. Due to underwhelming sales in Japan, Oku is said to only be eyeing the completion of ten volumes of the manga in total. In the ninth volume, it was confirmed that ten volumes would be the final total. It was one of the Jury Selections of the Manga Division at the 18th Japan Media Arts Festival Awards. It was also picked as a nominee for Best Comic for the 44th annual Angoulême International Comics Festival held in 2017. ^ All English episode titles are taken from Anime Strike. ^ "INUYASHIKI LAST HERO - The Fall 2017 Anime Preview Guide". Anime News Network. October 13, 2017. Retrieved August 28, 2018. ^ Thompson, Jason (May 22, 2015). "Inuyashiki - House of 1000 Manga". Anime News Network. Retrieved August 28, 2018. ^ "いぬやしき(9)" (in Japanese). Kodansha. Retrieved July 4, 2017. ^ a b c "Inuyashiki Anime's Promo Video Reveals Cast, Man With a Mission Theme Song". Anime News Network. August 24, 2017. Retrieved August 24, 2017. ^ "Inuyashiki Anime Adds Kanata Hongou to Cast". Anime News Network. September 1, 2017. Retrieved September 1, 2017. ^ a b c "Inuyashiki Anime Reveals More Cast, Ending Theme Song". Anime News Network. September 21, 2017. Retrieved September 21, 2017. ^ "Kodansha USA Adds Tsubasa: WoRLD CHRoNiCLE, Fairy Tail: Blue Mistral, L DK, Inuyashiki Manga". Anime News Network. October 12, 2014. Retrieved March 11, 2015. ^ "Crunchyroll Adds Inuyashiki Manga by Gantz Creator". Anime News Network. May 12, 2015. Retrieved May 17, 2017. ^ "Gantz's Hiroya Oku to End Inuyashiki Manga in Volume 10". Anime News Network. May 17, 2017. Retrieved May 17, 2017. ^ "Inuyashiki Manga By Gantz's Hiroya Oku Gets TV Anime, Live-Action Film Adaptations". Anime News Network. December 15, 2016. Retrieved December 15, 2016. ^ "Inuyashiki Anime's Trailer Previews Opening, Ending Themes". Anime News Network. October 5, 2017. Retrieved October 13, 2017. ^ "Amazon Discontinues Anime Strike". Forbes. January 5, 2018. Retrieved January 12, 2018. ^ ""Inuyashiki" Live-Action Film 1st Teaser Shows Flying Noritake Kinashi". Crunchyroll. December 20, 2017. Retrieved July 25, 2018. ^ "Japanese Comic Ranking, October 20–26". Anime News Network. October 29, 2014. Retrieved March 11, 2015. ^ "Japanese Comic Ranking, October 27-November 2". Anime News Network. November 6, 2014. Retrieved March 11, 2015. ^ "Japanese Comic Ranking, February 23-March 1". Anime News Network. March 4, 2015. Retrieved March 11, 2015. ^ "Hiroya Oku's Inuyashiki Manga Planned for 10 Volumes". Anime News Network. March 24, 2015. Retrieved July 12, 2016. ^ "Giovanni's Island Film Wins Media Arts Award". Anime News Network. November 28, 2014. Retrieved March 11, 2015. ^ "Inuyashiki, Sunny, My Brother's Husband, Chiisakobee Nominated For Angoulême's Top Prize". Anime News Network. December 18, 2016. Retrieved December 18, 2016. This page was last edited on 19 April 2019, at 10:53 (UTC).